Who’s afraid of the big, bad Swan? Once Upon a Time returns tonight for Season 5! Get a sneak peek of the premiere episode and TV special Dark Swan Rises: A Once Upon a Time Fan Celebration, starting at 7:00pm ET|PT on ABC. After that EPIC, game-changing season finale and a long summer break, the day we’ve been waiting for has finally arrived. 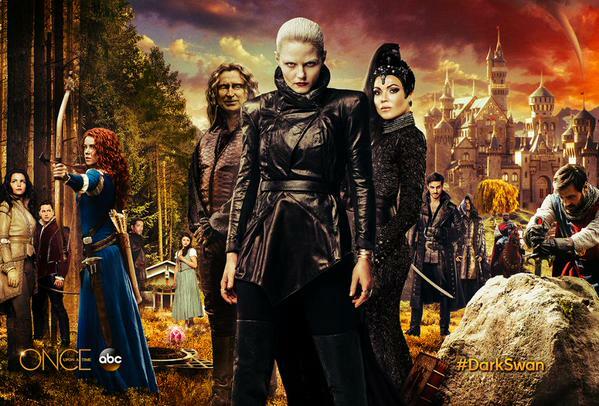 Fellow Oncers, TONIGHT Once Upon a Time returns for its fifth season! We’ve already gotten some glimpses of what’s to come (2015 San Diego Comic-Con, Disney’s D23 Expo), so we know that Emma is now the Dark One and will really struggle with that darkness. We also know that Killian, Henry, Regina, and the other Heroes will stop at nothing to free Emma from this curse. At the same time, the search for the Sorcerer Merlin is on, and we’ll be traveling to Camelot! In addition to our phenomenal regular cast, “The Dark One” has several guest stars, including Amy Manson as Merida, Sinqua Walls as Lancelot, Liam Garrigan as King Arthur, Timothy Webber as the Apprentice, and Mckenna Grace as Young Emma. Check out THREE sneak peeks from the upcoming show! In the first clip, Emma meets Merida in the Enchanted Forrest, but, unfortunately, not on the best terms. In the second video, back in Storybrooke, the Heroes turn to the Apprentice for answers about Emma’s whereabouts. The Apprentice presents them with a tool that can help. Merida knows *all* about shifty witches and terrible curses…and I guess she has a point. At least Emma isn’t a bear (LOL! ); however, I wonder why Merida needs the wisp…what’s going on in her kingdom? Also, I’m so sorry that the Apprentice has died! But how interesting that they’re going to need a villain to wield the wand…someone wicked…like a Wicked Witch AKA Zelena! Of course, Killian will do whatever it takes to get to Emma, and it looks like Henry is in the same boat. After all, he isn’t a kid anymore, right? EEEEP! I’m so excited for this season! Jennifer Morrison has been bringing it as the Dark Swan and I can’t wait to see how Emma’s character evolves. I’m also really eager about drowning in CaptainSwan feels, especially given the possibility that Killian would go dark to be with Emma (OMG!). Finally, I’m super curious about Merlin the Sorcerer and whether he’ll actually be able to help us. So many questions and so much to look forward to! Then Season 5 premieres right at 8:00pm ET|PT *EXCITE* I’ll be live tweeting all the fun, so make sure to tune into “The Dark Swan” and join in!